Fig. 1. Arthur Rackham. 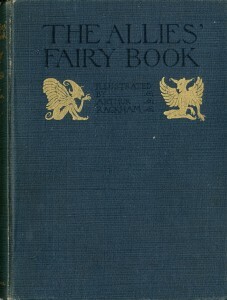 Front Cover for The Allies’ Fairy Book. Heroism, bravery, violence, romance, villainy and a love of the land are just some of the important themes found in fairy tales. These themes can also be seen in discourses surrounding the Great War. More specifically, such fairy tale motifs are integrated with the historical context of the Great War in The Allies’ Fairy Book (Fig. 1), a compilation of fairy tales published in 1916 by William Heinemann and J.B. Lippincott, and illustrated by Arthur Rackham. Heinemann was a man in favour of the war effort, and J. Lippincott was a children’s publisher and author himself, which gives insight into their interest in this project (St. John 157; Kokkola). An edition of this text was also circulated in Toronto in 1916 by S. B. Gundy (“The Allies’ Fairy”). The Heinemann and Lippincott edition is housed today in the Children’s Literature Archive at Ryerson University. Often, the influence of the Great War on both women and children is underestimated. However, children experienced loss of loved ones and were proven to be very much aware of and involved in the war (Gillis and Short). This exhibit will explore the imaginative space of the fairy tale as ideal for selling the themes of war to children. Although not explicitly, these particular fairy tales are resurrected from existing repertoires and employed as propagandistic tools to familiarize children with wartime ideologies such as violence. These tales of fantasy also serve as a form of reassurance for children of the Great War that eventual safety, security and a “happily ever after” are guaranteed. Fig. 2. Arthur Rackham. 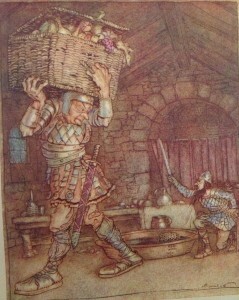 “At the dead time of the night in came the Welsh Giant.” Illustration for “Frontispiece” of The Allies’ Fairy Book. The Allies’ Fairy Book is a collection of thirteen fairy tales from eleven Allied nations of 1916. English, Welsh, Scotch, Irish, French, Italian, Portuguese, Russian, Serbian and Belgian countries each are represented by one tale, as well as three shorter Japanese tales. The introduction by Edmund Gosse claims that although these stories have been connected with the folk lore of many nations at different points in time, the form of each story chosen for this particular publication is characteristic of the country with which they are associated in the fairy book (Gosse ix). Although each collected tale is different, many of them share common themes and classic fairy tale tropes including the brave hero, the three part quest structure, the villain and the “happily ever after” ending. Throughout the book are eleven full page colour illustrations and a frontispiece (fig. 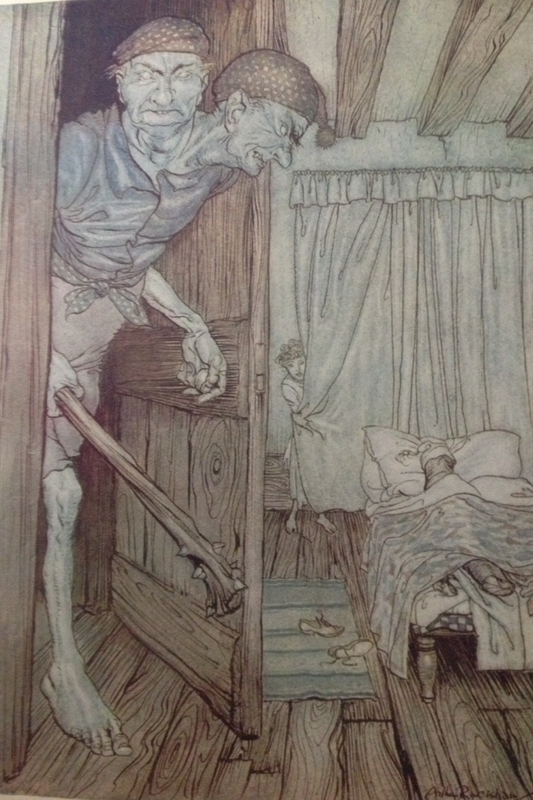 2) depicting scenes from the fairy tales, as well as smaller monotone illustrations all created by Arthur Rackham. Rackham was one of the foremost illustrators of his time and with the onset of war, he was involved in numerous publications of a patriotic nature, like The Allies’ Fairy Book (Hudson 104). Often, literature is contextual in nature and may be used in different ways depending on socio-historical factors. Denise Escarpit as cited by Zipes, notes that, “According to how a tale was cloaked, it could assume very diverse forms that were functions of social and cultural imperatives” (Zipes 9). Although the fairy tales collected in The Allies’ Fairy Book are not written specifically for the purposes of wartime propaganda, popular children’s literature forms, like fairy tales or picture books, become invested with new meanings because of the surrounding context of war (Johnson 60). As the preface to The Allies’ Fairy Book states, “It is when the hearts of country folk are hushed and silent that the mysterious voices of goblins are heard calling…” (Gosse xii). Well known stories are therefore brought back in unstable times to serve a new, political purpose. Fig. 3. Arthur Rackham. “And thereupon King Lludd went after him and spoke unto him thus: ‘Stop, stop,’ said he.” Illustration for “Lludd and Llevelys” in The Allies’ Fairy Book. Facing p. 32. Wartime propaganda began in 1914 as an emphasis on values such as patriotism and duty (Simmonds 227). These meanings are latent in fairy tales and can be drawn out only by looking at the themes of these pre-established tales and matching them with similar wartime ideologies. For example, the themes of patriotism and allied interdependence are found in the Welsh tale, “Llud and Llevelys” (Fig. 3.) In this story, one brother rules over France, and one over Britain. When three plagues fall on Britain, the two brothers come together to free the land of the plagues and live in peaceful prosperity from then on. Although the allied connection was non-existent prior to 1914 when this tale was originally created, the contemporary child of the Great War may imbue the text with this meaning of international camaraderie between allied countries due to the historical moment they are living in. The child was expected to carry on as normal during the Great War on the home front, and these fairy tales provided a means of coming to understand and accept the effects of war (Gillis and Short). Thus children, presented early on with ideals of patriotism and nationalism, become familiar enough with war to stand in good faith if ever called to support their state (Johnson 65). One propagandistic aspect of this book is in the title of the work itself. Naming the collection The Allies’ Fairy Book carries with it the suggestion of commonalities among the allied countries of 1916. The familiar “once upon a time” narrative is one that is native to the fairy tale genre in general, despite the individual national characteristics of different tales (“Once Upon” 47-48). The idea that a book of fairy tales has been created specifically for citizens of allied countries evokes a common heritage in their folklore. This is affirmed in the introduction by Gosse which notes that “We have not forgotten the almost universal distribution of fairy-tales, and the uniformity with which a certain tradition reappears in the legends of one country after another” (Gosse xii). The children who read this book could understand their own individual nation in relation with the other allied countries mentioned, and could imagine where they fit in on an international level. One of the main audiences for the text at the time of its production was young children as it was historically advertised as a beautiful Christmas book for children and was targeted to children in newspapers right through to 1918, the final year of the Great War (“Books for Children” 16). Ideals of the war could therefore be sold to children latently through these fairy tales. Fairy tales are invested with new meanings due to the context of war, and thus the glorification of violence can be transferred from the pages of The Allies’ Fairy Book, to the real experiences of the child living through political and social upheaval. Cesarino valiantly slays the dragon and is met with celebration in “Cesarino and the Dragon” and the king’s son is thanked heartily for helping a raven defeat and behead a snake in a great battle between animals in “Battle of the Birds ” (Gosse). The Allies’ Fairy Book does not shy away from violence and in fact, celebrates the brave hero committing the violent acts. The question then becomes, how does this impact child readers living through the Great War? Fig. 4. Arthur Rackham. 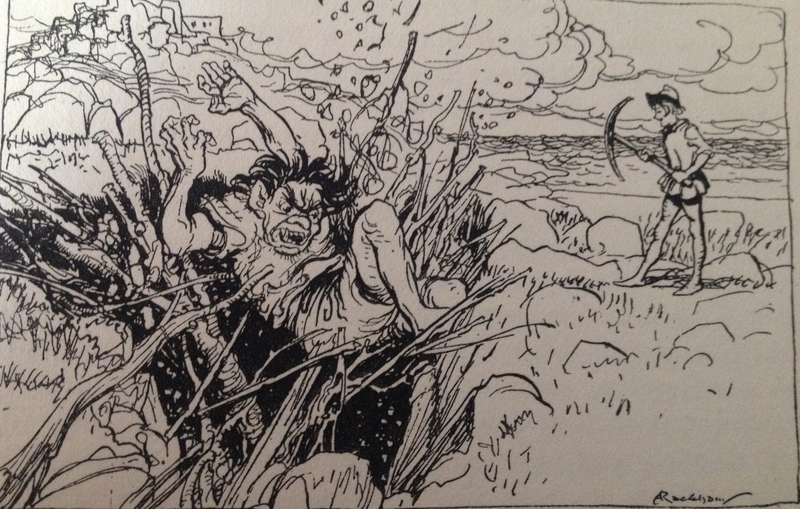 “He Tumbled into the pit and made the very foundations of the mount to shake.” Illustration for “Jack the Giant Killer” in The Allies Fairy Book. p. 3. On the one hand, the child is fascinated not by the upward social mobility in fairy tales, but by the overcoming of dangers and the following praise that comes of it (“Fairy-Tale Hero” 318). Certain aspects of war, such as new technologies, which served as a means of violence and a source of fear for adults, actually emerged as a source of interest and excitement in written work by children during the Great War years (Gillis and Short). Many people viewed the war as a noble crusade and children seem to have adopted similar ideas (Paris 6). 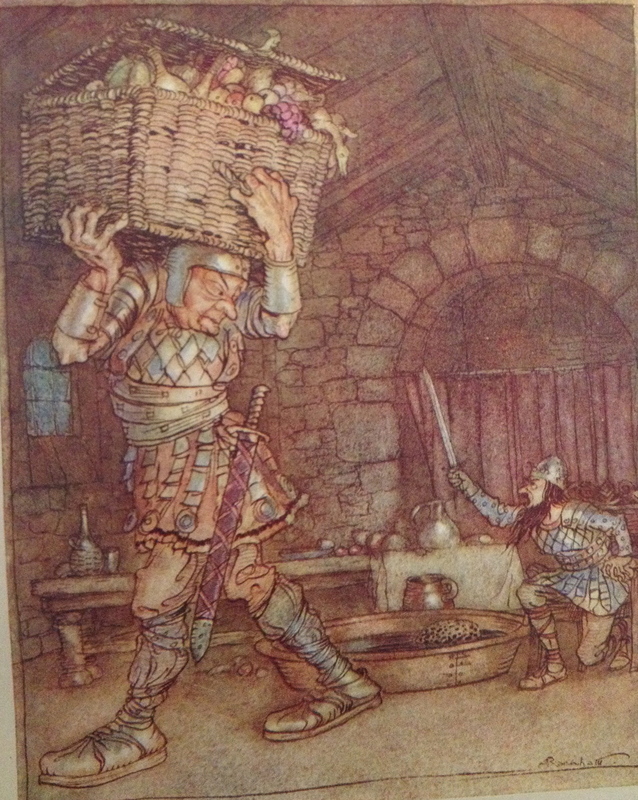 With this in mind, the connection between violence and virtuous duty can be drawn out in “Jack the Giant Killer” as Jack, the young English boy, proudly kills giants in honour of the king of England who rewards Jack’s nobility with a castle and estate (Fig. 4). It would be with pride that a child (especially an English one) read about Jack’s violent victories as a service to his country. The purpose of propaganda was to indoctrinate children into the war (Johnson 59-60). Although the fairy tales do not explicitly elicit children’s support of war, the themes express a valorization of values which are in common with it. However, there is also more to fairy tales than the external action. As Tatar suggests, there is a question as to whether fairy tales can serve as an antidote to feelings of defenselessness during the period of war (238). To this end, symbolic wish fulfillment or the “liberating potential of the fantastic” as Zipes calls it, plays a part as well (Tatar 242). In the imaginative space of the fairy tale, children can see their own experiences of danger and trauma located at a distance in the “once upon a time” of the fairy tale and see the potential for safety and security provided by the “happily ever after” (Tatar 242). For example, Little Peachling in the Japanese tale, “The Adventures of Little Peachling,” battles with a band of ogres and takes their king prisoner in order that the conquered ogres will hand over their treasures (Gosse 86). Little Peachling brings his winnings home to his foster parents and they all live in eternal peace. Although the story does not relate directly to the experience of war, the prospect of a peaceful outcome for the brave protagonist following violent battle serves as symbolic reassurance for the child living through a period of total upheaval. 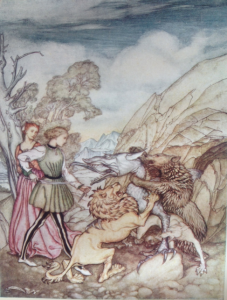 All editions of The Allies’ Fairy Book are illustrated by popular children’s literature illustrator of the time, Arthur Rackham. It was not unusual for Rackham to sign deals with both American and European publishers in order to increase the printing numbers and thus widen the geographical area of reception (St. John 105). Rackham was an important name to have attached to such a work and his illustrations proved to be a big selling point for buyers at the time. Evidence of this is seen in the fact that a special deluxe edition of only 525 copies was created and signed by Rackham to be sold to collectors (Hudson 169-170). It was common for Rackham to create these special editions on handmade paper, number and sign them and then sell them at a much higher price than trade copies which shows that people were willing to pay for an original and personalized Rackham work (St. John 105). Also, the fact that many historical advertisements have The Allies’ Fairy Book listed under headings such as “This Years’ Rackham” supports the idea that his drawings were indeed a main selling feature (“Heinemann’s” 535). Thus, one of the major targeted audiences for the book was collectors of the illustrator’s work. Fig. 5. Arthur Rackham. 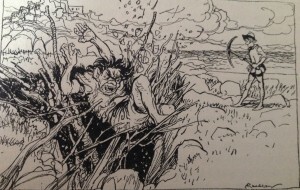 “So Valiantly Did they Grapple with him that they bore him to the ground.” Illustration for “Cesarino and the Dragon” in The Allies’ Fairy Book. Facing p. 68. The illustrations in this work serve to reinforce the romanticization of fear and violence, which are both wartime themes. Perhaps the best example of this is the image from “Cesarino and the Dragon” (Fig. 5) where Cesarino stands bravely in front of the king’s daughter, armed with a knife and ready to defeat the monstrous dragon. 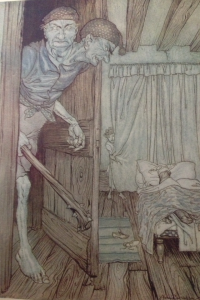 Cockrell describes Rackham’s drawings as beautiful yet sinister which is apparent in this image which uses light colours to depict a darker scene of violence (313). The violent act is also set up as one of heroism by having the frightened looking woman taking cover behind Cesarino, the hero who can be likened to a soldier of the Great War with his armor and weapon. The protective paper for the image has a quote which states “so valiantly did they grapple with him that they bore him to the ground and slew him” (Gosse, facing 68). The word “valiant” depicts the way that the images expose children to the themes of heroism and excitement which many imagined the war would include (Wilcox). However, the image does little to reflect the actual grim and monotonous life of soldiers in the Great War (Wilcox). Thus, the illustrations highlight specific romantic or chivalric aspects of violence in order to foster a more positive perception of violence in general which can then be transferred to the surrounding context of war. Books for Children. Advertisement. The Globe (1844-1936) 23 Dec. 1918: 16. ProQuest. Web. 20 Feb.
Gillis, Stacy, and Emma Short. “Children’s Experiences of World War One.” The British Library. British Library, n.d. Web. 9 Feb. 2014. Gosse, Edmund, comp and intro. The Allies’ Fairy Book. 1st ed. Illus. Arthur Rackham. London: William Heinemann; Philadelphia: J.B. Lippincott, 1916. Print. Children’s Literature Archive, Ryerson University. Heinemann’s New and Forthcoming Books. Advertisement. The Spectator 4 Nov. 1916: 535. ProQuest. Web. 20 Feb. 2014. Hudson, Derek. Arthur Rackham: His Life and Work. Illus. Arthur Rackham. London: Heinemann, 1974, 1960. Print. Johnson, Eric. J. “Under Ideological Fire: Illustrated Wartime Propaganda for Children.” Under Fire: Childhood in the Shadow of War. Eds. Goodenough, Elizabeth and Andrea Immel. Detroit: Wayne State U pub., 2008. 59-76. Print. Luthi, Max. Once Upon a Time: On the Nature of Fairy Tales. Trans. Lee Chadeayne and Paul Gottwald. Bloomington, Ind: Indiana U Press, 1970. Print. —. “ The Fairy-Tale Hero: The Image of Man in the Fairy Tale.” Folk & Fairy Tales. Ed. Martin Hallett and Barbara Karasek. 4th ed. Peterborough, Ont. : Broadview Press, 2009. 315-323. Print. Paris, Michael. Over the Top: The Great War and Juvenile Literature in Britain. Westport, Conn.: Praeger, 2004. Print. Simmonds, Alan G.V. Britain and World War One. Abingdon, Oxon; New York: Routledge, 2012. Print. St. John, John. William Heinemann: A Century of Publishing, 1890-1990. London: Heinemann, 1990. Print. Tatar, Maria. “‘Appointed Stories:’ Growing Up with War Stories.” Under Fire: Childhood in the Shadow of War. Eds. Goodenough, Elizabeth and Andrea Immel. Detroit: Wayne State U pub., 2008. 59-76. Print. “The Allies’ Fairy Book (Book, 1916) [WorldCat.org].” N. p., n.d. Web. 10 Mar. 2014. Wilcox, Vanda. “Combat and the Soldier’s Experience in World War One.” The British Library. British Library, n.d. Web. 9 Feb. 2014. Zipes, Jack. Fairy Tales and the Art of Subversion. 2nd ed. New York: Routledge, 2006. Print.